John Houston washed the feet of his father, Steve Houston, at Holy Thursday Mass at Sacred Heart Church in Valley Park. John has autism, and the family has helped the parish become a more welcoming place for children with disabilities. John Houston carefully lined up his action figures in neat rows on a coffee table. The largest Buzz Lightyear figures were placed in the back, the medium-sized ones in the middle, and the smallest in the front. He added to the lineup a handful of Lilo and Stitch toys in the same fashion. When the conversation switched to church, John broke from the routine of lining up his toys to explain why he likes serving at Mass on Saturday mornings. Steve and Kathy Houston knew early on that something was different about John’s development. The milestones of infancy — crawling, standing and walking — took longer than the average child. “After he turned about a year old, we were told that he had ‘pervasive developmental delays,’” Steve Houston explained. 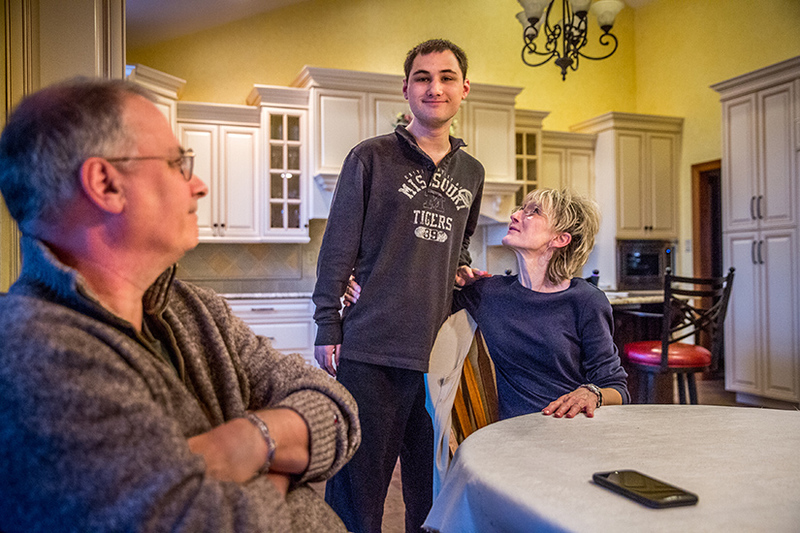 “I wasn’t sure what that term meant, but after he turned two years old it crystallized into a diagnosis of autism.” About 20 years later, genetic testing revealed John has Renpenning Syndrome – a genetic disorder that is a contributor to autism. 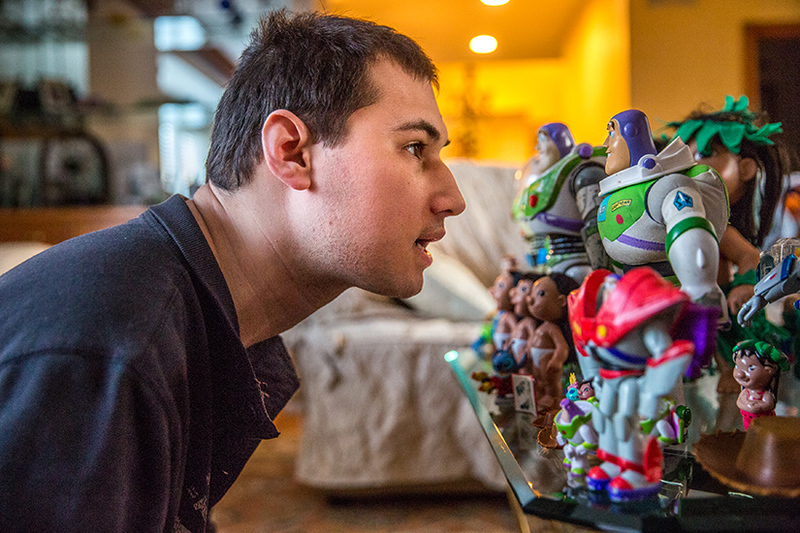 John Houston played with his favorite action figures, including Buzz Lightyear and Lilo and Stitch, as he set them up in groups on April 4. Houston, who has autism, serves Mass occasionally and enjoys attending Mass at Sacred Heart Church in Valley Park. As the Houstons sought therapy for John to address his developmental needs, his parents also understood the need for spiritual development. The Houstons moved to Sacred Heart Parish in Valley Park when John was 6 years old, and the family made it a point to sit in the front row. Now as a 23-year-old, John Houston occasionally serves at Saturday morning Masses with his dad and frequently gives out hugs to fellow parishioners at Mass. He received his faith formation, including sacramental preparation, from PSR teacher Clare Evertowski. She carefully crafted methods of teaching to help him relate to the lessons. A diagram with happy and sad faces was used in preparing him on how to make a confession, for example. And as it turns out, members of Sacred Heart have certainly connected with John. Parishioner Steve Kansteiner recalled a moment earlier this year when John stepped out of his pew at church to hug members of the RCIA program who were at Mass to be elected for baptism. John Houston, center, talked with his parents, Kathy and Steve Houston. John has autism, and the family says that their parish, Sacred Heart in Valley Park, has become a welcoming place for children with disabilities. Sacred Heart is one of numerous parishes in the archdiocese that organizes an annual Mass for families with special needs. But beyond that, parishioners of Sacred Heart have taken a special interest in being a welcoming place for people who have different abilities, said former pastor Father Denny Schaab. Father Schaab recalled the initial challenge of connecting with John when he met the family years ago. There wasn’t much conversation or eye contact. As the priest developed a relationship with the family, there was a breakthrough, and Father Schaab became a “church father” to John. About the time Houstons received John’s autism diagnosis, the Centers for Disease Control (CDC) reported in 2000 that the prevalence of autism was one out of 150 children in the United States. The prevalence rate has increased in the past decade and a half to one in 59 children, an increase of 157 percent. The CDC describes autism as the fastest-growing developmental disability. Dr. Jenny Heithaus, a developmental pediatrician with the Knights of Columbus Developmental Center at SSM Health Cardinal Glennon Children’s Hospital, said the shift is in part due to earlier diagnosis of autism in children, as well as an expanded understanding of its characteristics. John Houston served Mass in 2014 at Sacred Heart Church in Valley Park. 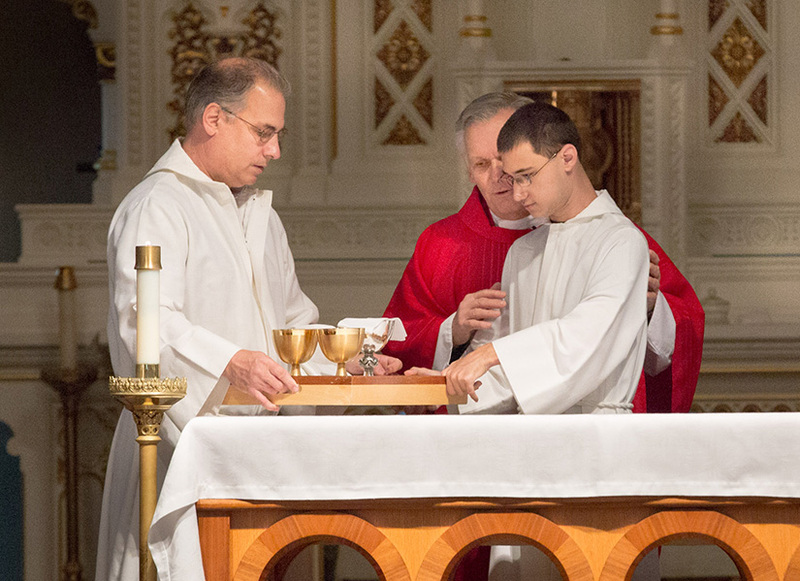 His father, Steve Houston, assisted John in serving the Mass with celebrant Father Denny Schaab. The CDC describes autism spectrum disorder as a developmental disability that is caused by differences in how the brain functions. People with autism may communicate, interact, behave and learn in different ways. Steve and Kathy Houston have shared more about their lives with fellow parishioners, especially through participation in several ACTS retreats at Sacred Heart. On a retreat several years ago, Steve Houston shared what it was like when their son was diagnosed with autism. He spoke about the importance of reveling in the life that God creates, and how others can learn from people with autism. “He’s made me appreciate the ability that I have to connect with another human being,” Steve Houston said. “John doesn’t really have that.” But there are other gifts that he has to share, including an intense love of God and church. Autism Speaks provides resources for families and faith leaders to help families to help people with autism feel welcome in their church community and become active participants. Resources include pew cards, tips to organize a special-needs religious service, guidelines for clergy and religious educators for conversations with parents, and social stories on going to church. Visit www.autismspeaks.org/religion. Introduce yourself to a family in your parish that has been touched by autism. Autism can create social isolation for the family; networking with others can build stronger communities and enrich one’s faith. Some individuals may be unable to attend the entire Mass. They may need extra space in the pew or a break. Their parents may bring books or Mass kits for them. Every person is a gift from God, has a human and universal need of spiritual connection to our Creator and His Son, Jesus Christ. Even people who are non-verbal can acknowledge this connection through gesture or respectful temperament. We are all made in the image and likeness of God and, therefore, have inherent value and worth. The limitations of what we might be able to do are extrinsic to the measurement of our inherent human dignity. Every human being is a person first, not a diagnosis; so we strive to use people-first language in all of our conversations. • Contact your priest and and introduce your child. Don’t assume he knows everything about autism. Be willing to offer information and communicate any accommodations that could help your child. • Consider sharing your family’s story in appropriate situations, such as a CRHP or ACTS retreat setting, or other parish ministry. • Don’t give up hope if your child is having difficulties at church. The fact you brought your child to Mass is great — they spent time in the presence of Jesus! • Seek out other families with children who have special needs. Consider forming a parish ministry that provides support to one another and raises awareness of people with different abilities. Autism is a complex behavioral diagnosis that has two main criteria: difficulty with social communication and repetitive and restrictive behaviors and interests, according to Dr. Jenny Heithaus, a developmental pediatrician with the Knights of Columbus Developmental Center at SSM Health Cardinal Glennon Children’s Hospital. Repetitive behaviors are present because of a person’s need for routine and organization, she noted. “Sometimes that comes out in body posture — hand flapping, toe walking, hand posturing.” Other characteristics may include the use of scripted language or restricted interests that permeate many, if not most, aspects of their lives. Other people with autism have difficulties with transitions or excessive tantrums. Some people with autism also have difficulty with processing things within their environment, such as sounds and lights. The Knights of Columbus Developmental Center provides diagnosis and medical management for children with autism. The center also provides some therapy services, including a social skills program for teens, an early intervention program for children under three and speech therapy. The majority of patients are within a 150-200 mile radius. Once a child receives a diagnosis, the center connects them with resources within the community. Recognizing the subtleties of the characteristics of autism often leads to earlier intervention, which helps children with behaviors and how they process the environment. Autism spectrum disorder is a developmental disability caused by differences in how the brain functions. People with autism may communicate, interact, behave and learn in different ways. Signs of autism begin during early childhood and usually last throughout a person’s life. In April 2018, the Centers for Disease Control and Prevention (CDC) released new data on the prevalence of autism in the United States. The study identified one in 59 8-year-old children as having autism. The number is higher than an estimate released in 2016, which indicated a diagnosis of one in 68 children. Data was taken from 300,000 8-year-old children in 11 communities (including Missouri) as part of the CDC’s Autism and Developmental Disabilities Monitoring Network. The program is the largest population-based program to monitor autism and the only autism tracking system that examines health and education records. To learn more about the CDC’s autism tracking activities, visit www.cdc.gov/Autism. The CDC also has a program with resources for parents, child-care providers and health-care professionals for monitoring children’s development. For more information, see www.cdc.gov/ActEarly.